I am putting in 39 photos for your pleasure! Enough photos for the whole week. Please click on them as I put them in really small. So I am warning you this post is heavy on the photos. Also heavy on the "p" words as the ABC Wednesday Meme is at that letter. Here we go. Above we have a collection of butterflies. 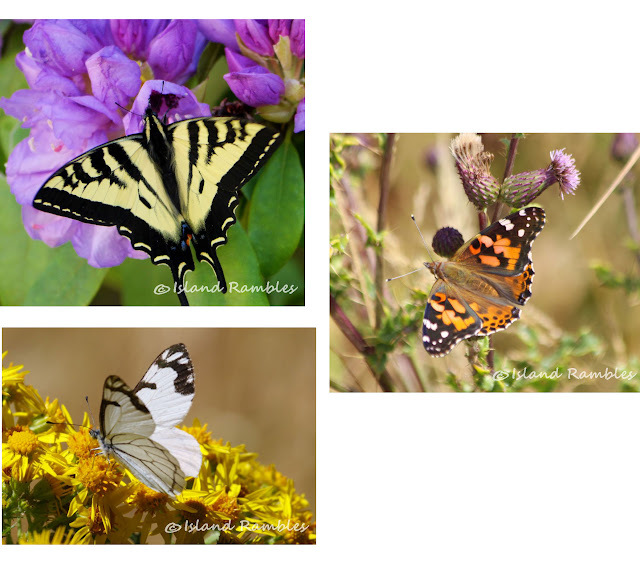 A Western Tiger Swallowtail on purple flowers, a Painted Lady and a Pine White. These are for ABC Wednesday and Nature Notes Tuesday as Michelle likes butterflies so much. 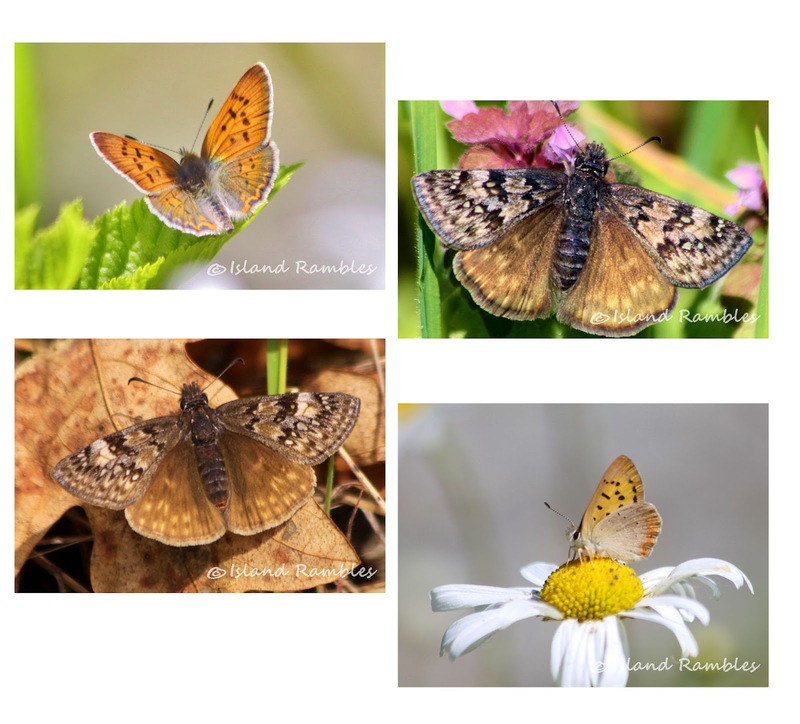 Above more butterflies for you: two Purplish Coppers and two Propertius Duskywings. For Ruby Tuesday some Red! Peacocks for Our World Tuesday. 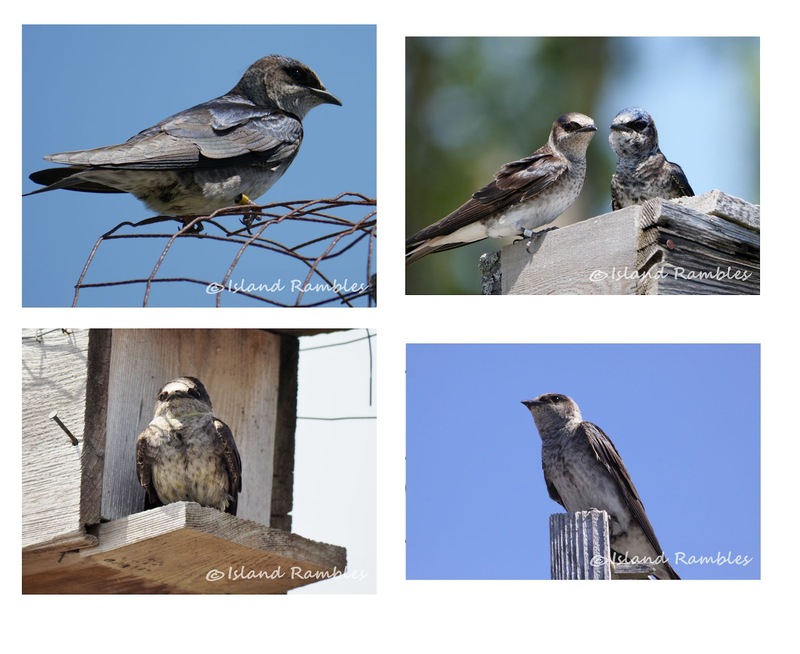 Purple Martins for the bird memes, these are for Stewart at Wild Bird Wednesday. Here are some birdies for Anni at the Bird D'Pot. 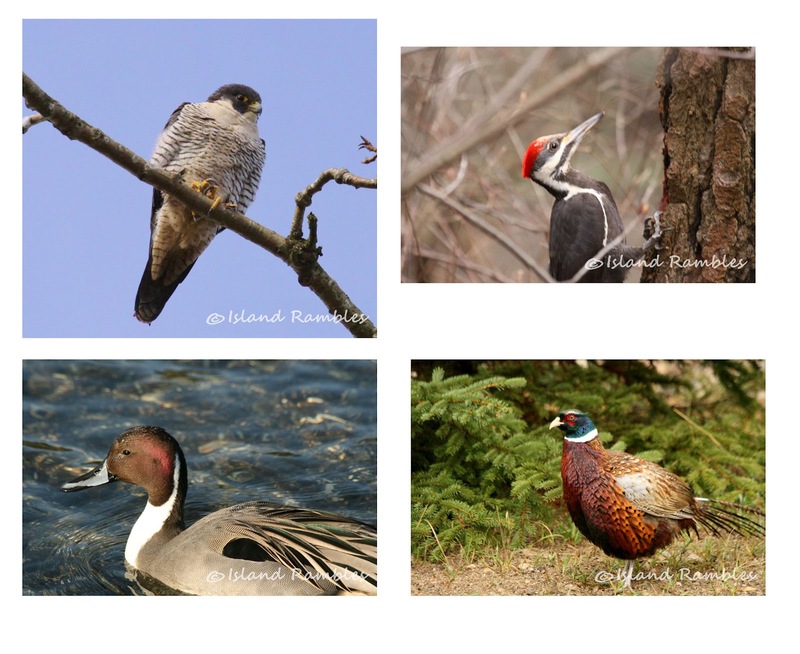 A Perigrine Falcon, a Pileated Woodpecker, a Pintail duck, and a Pheasant. Here is a Palm Warbler, a Pigeon and a Pied-billed Grebe. 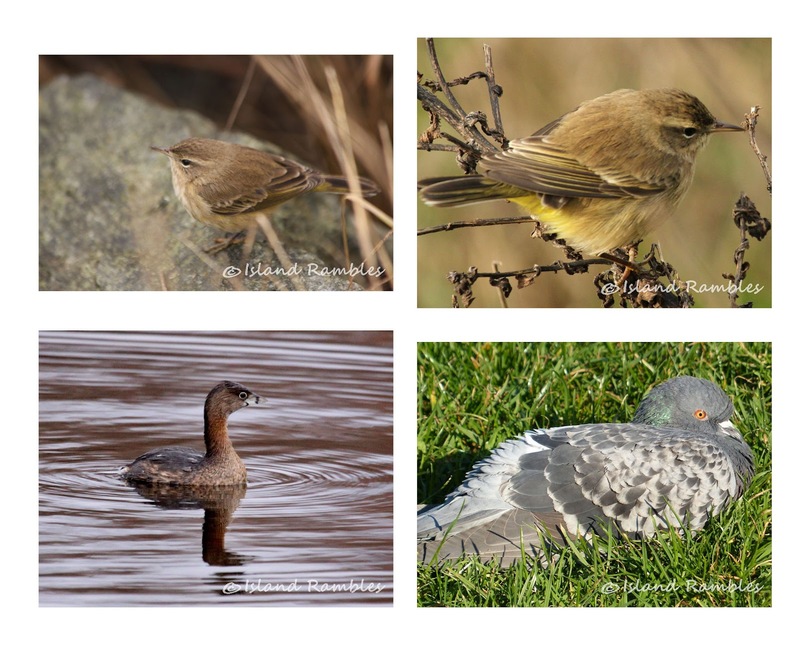 Please check out the links at the end of the post to find wonderful blogs with many photos. Thanks to the great hosts of all these long time memes. My life seems to consist and revolve around them! Groups of us now have been doing these memes for ten or more years. Another of the same Perigrine Falcon and a Pacific Golden Plover. 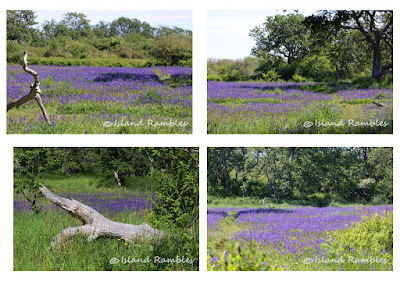 For Outdoors Wednesday we have Uplands Park with lots of purple flowers called Camus. 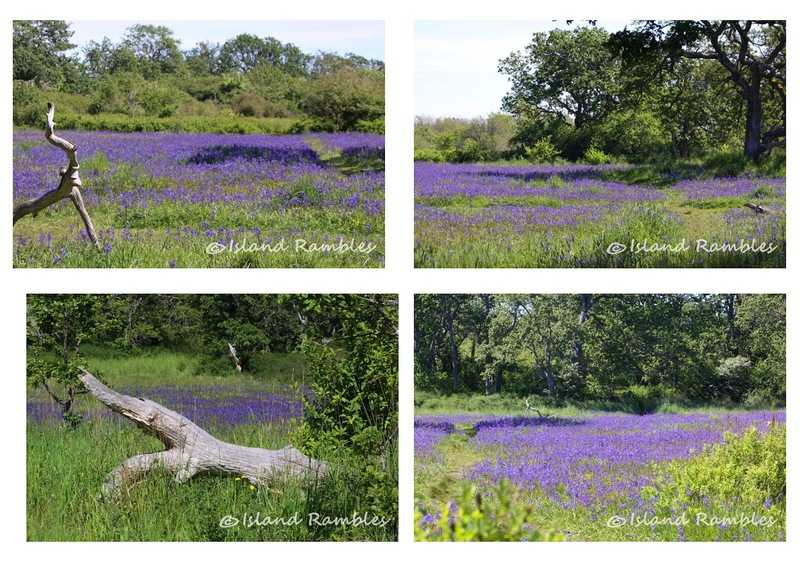 This is a mixture of photos, Cattle Point with a lovely fence for Good Fences Thursday. The Parliament Buildings looking up to see the tiny statues and small pink flowers for Little Things Thursday. Port Renfrew Beach for Water World Wednesday and below Parksville and Salmon Point for Wednesday's Waters. If you are a Paleontologist you would love to go to Muir Creek and see all the old fossils for Tuesday's Treasures. Phew, now I am pooped out and must go and pass out from all these pretty pictures. I hope you enjoyed my collages of so many photos. Please leave a comment and tell me which is your favorite. These are all my favorite photos and basically it shows my life for the last few years in a series of photo collages. I put in my posts for a few days that is how I do it now due to my health and eyesight. You have once again shown a wonderful set of pictures.The variety is lovely to see. Awesome collection of photos! I think I like the butterflies the best. 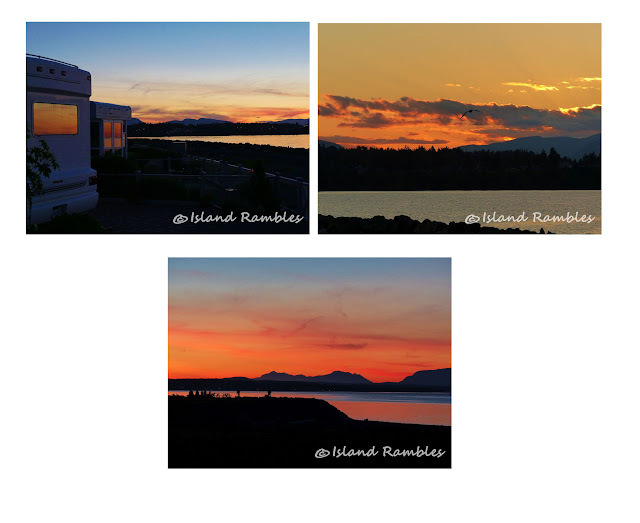 Hi Nora, another gorgeous series of captures from your beautiful part of the world. Love the vibrant peacock shots! Beautiful post, Nora. I love all the colourful flowers, interesting birds and wonderful water scenes. The butterflies are exquisite; I'd've been proud to have taken just one picture like that. And there's something about Pintails that I've always found irresistable. How could one pick a favourite with so many beautiful shots but of course being a birder I loved all the birds especially the close ups of the Parrotts and the butterflies were very pretty. That's a fantastic selection of really beautiful photographs - you have been busy. As I'm here from Ruby Tuesday - my fave has to be the delightful parrot! Beautiful series....love the peacocks and beach scenes! Hello, gorgeous images! 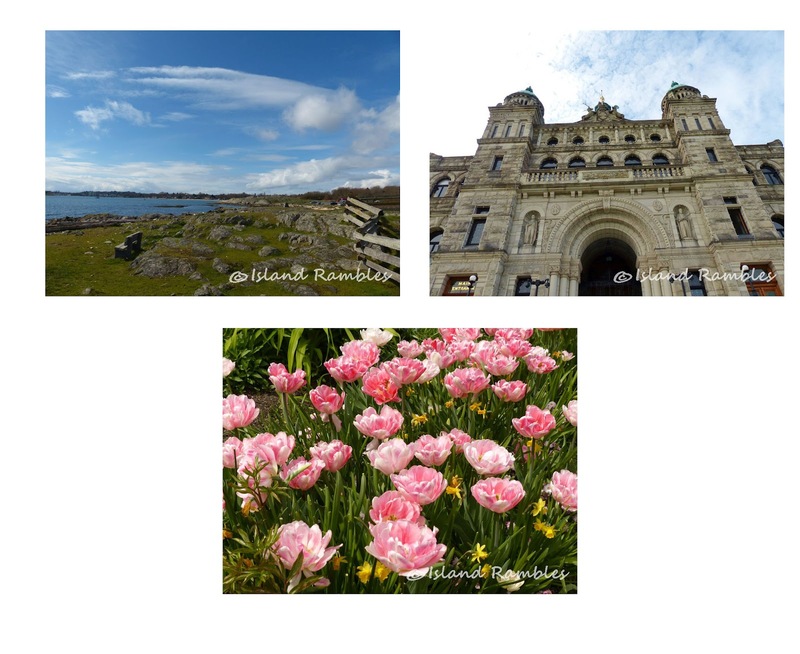 So many pretty birds, scenery, flowers and lovely sky captures. Great post. I hope you feel better soon, take care! Happy Tuesday, enjoy your day! Lovely images! The peacock is very striking! And I really like the little purple flowers (camus)... Too pretty! Have a beautiful week! wonderful photo's, a joy to look at! Nora, treasures abound. For me, nature is what I treasure the most. Thanks for sharing all of your beautiful images and please hurry back soon. These are all beautiful, Nora. I can't pick one over all the others. I would love to go where there are fossils. There is a beach in Capitola that Roger and I have walked many, many times. It's only reachable at minus tides, and even then it is not really a safe place to be. But we can't help ourselves, we go and marvel at the fossils. Lots of beautiful photos here! But then I know the beauty of our area just like you. Hello! Great series of birds! 39 photos of that quality, wow! you must have tons of archives to dig out so many. All were truly worth posting. I'm a sea and beach fan so of course your black sand beach appealed to me but I also fell in love with your butterflies and flowers, especially the carpets of camus and also those you called 'pink flowers' that I wasn't sure I could identify: very open tulips maybe? Anyway this post is like a treasure trove, I went from marvel to marvel. Thanks also for the links to the memes, I only knew very few of them. There're an inspiration. Connecting with others is one of the best joys of blogging. Have a nice week and thanks for passing by at my blog! I knew little or nothing about Vancouver and the surrounding islands. That is until I joined ABCW. really looking forward too meeting up again. Delightful images! I'm painting a peacock right now. It's is so hard to do them justice. Parts of Australia have those red and blue parrots in the wild - now that would be a thing to see. Such beauty...all the way around. From the flowers to the birds...such eye candy. The PACIFIC plover looks quite a bit like our Black bellied plover in Texas. I'm amazed. These are all beautiful collages Nora but I particularly like the one of the purple Camus flowers. Take care and have a lovely weekend. I love all the birds but especially that stunning parrot! My oh my! So brilliant! a beautiful bunch of color. :) love the pintail and the pied-billed. two of my faves. such pretty blooms and butterflies, too. Hard to pick favorites when there is so much to view. They were all quite wonderful. I do love pretty flowers and beaches though. So nice NOra! Your posts are like a wonderful nature magazine; I can enjoy each one more than once just gazing at the beauty (and from the Pacific Northwest, so wonderful memories for me too). I just Love this photos of butterflies! So many gorgeous photos! It is hard to pick a favorite but I will choose the butterflies. Just lovely!! Really enjoyed the brightly colored photos! A fabulous collection of photos! I enjoyed each and every one of them. Enjoy your day! A beautiful series of photos. I love butterflies, birds and flowers in the meadows. Regards.